Note: These are my notes from my presentation/discussion at the LCC Centre for Engaged Inclusion today and also for use in my Comparative Systems class. Is “Right to Work” About Freedom? It’s Rick Snyder’s incredible flip-flop here in Michigan on so-called “Right to Work” legislation and his claims that it’s about “freedom” that brings me back to blogging. Lately I’ve been getting increased questions about what “Right to Work” really means. So, let me try to cut through the Orwellian rhetoric and explain. So called “Right to Work” laws have absolutely nothing to do with “freedom” for workers. The “freedom” talk is purely a made-up rhetorical lie intended to get gullible workers to support something that most likely is not in their personal best interest. Supporters of so-called “Right to Work” laws (RTW) claim it’s about establishing the “freedom to not be forced to join a union”, that it’s about “freedom of association”. But that is an absolute falsehood. Forcing someone to join a union as a condition of employment is called a “closed shop” rules. Ever since the 1948 Taft Hartley (a US law covering all states) “the closed shop” has been illegal. Let me repeat for clarity. Forcing someone to join a union as a conditon of employment has been illegal everywhere, including Michigan, since 1948. RTW laws change nothing in this respect. But Taft Hartley law also says that if a union is certified as bargaining representative, then the union must bargain on behalf of ALL employees, whether union members or not. Further all employees are covered by the union-negotiated contract, whether members or not. A union becomes the certified bargaining representative by a vote of ALL employees at some point in time, with a majority necessary to cerify. A union may be de-certified later by another majority vote of all employees (whether members or not). Until the union is decertified, the non-member employees benefit from the contract and are covered by the contract. If a union is certified to represent, non-members are not free to strike different deals or contracts. But did you know that Taft-Hartley further requires that the union be additionally obligated to provide non-members’ with virtually all the benefits of union membership even if that worker elects not to become a card-carrying union member? By way of example, if a non-member employee is fired for a reason that the employee believes to constitute a wrongful termination, the union is obligated to represent the rights of that employee in the identical fashion as it would represent a union member improperly terminated. So rock solid is this obligation that should the non-union member employee be displeased with the quality of the fight the union has put forth on his or her behalf, that non-union member has the right to sue the union for failing to prosecute as good a defense as would be expected by a wrongfully terminated union member. Obviously, the Taft Hartley law puts a burden on unions. A certified bargaining agent union must bargain on behalf of all workers, whether they are members or not. That costs the union money and time. Yet,the union may only collect “dues” from members. Herein lies the difference between RTW states and the rest. The rest should properly be called “union shop” states. In a “union shop” state such as Michigan was until yesterday (Dec 11, 20123), the certified union may charge “agency fees”, not “dues”, to non-member employees on whose behalf they bargain. Agency fees are required by law of non-member employees in union shop states. In RTW states, non-member employees do not have to pay agency fees. In RTW states, non-member employees are allowed to benefit from the contract and protections and bargaining power of the union without paying a dime to support the bargaining activities. The agency fees are established in union shop states to reimburse the union for it’s costs of negotiating, bargaining, etc. RTW laws are all about how much money gets paid to certified unions and have nothing to do with “freedom”. unions use some of their money for political “speech” purposes: campaign contributions, advertising, lobbying, etc. Ergo, the laws were forcing the non-members to supoort political speech with which they disagreed and therefore should be considered unconstitutional under the US Constitution 1st Amendment. The Supreme Court “split the baby” and developed a solution that acknowledged both sides. The Supreme Court established that required agency fees are indeed constitutional (ie. “union shop” laws are constitutional). But, it also said that requiring non-members to support political speech and activities with which they disagreed was not constitutional. The solution lay in establishing that unions report the amounts they spend on political speech and adjust the agency fee to be some fraction of the dues. In other words, if the dues for members were $40 per month and the union reported that 20% of it’s total expenses were for political speech activities, then the agency fee would have to be set at $32. This decision was one of a few public policy and economy changes that helped to reduce union influence in the political arena starting in the 1980’s. There were other more significant ones such as the PATCO strike, but the Supreme Court decision did help reduce marginally some of the money and support unions could provide to union-friendly politicians. The effect was most pronounced in private sector unions. Indeed, the battle over RTW laws vs. union shops has nothing to do at all with “freedom for workers”. It has everything to do with money for political campaigns and political activities. Historically, most union political activities have been in support of Democratic candidates, but not always. Republicans perceive they can gain a significant advantage and perhaps a permanent power majority if they can weaken unions and cut-off the political support unions provide to Democrats while simultaneously increasing their financial support from corporations and billionaires, neither of which face any limitations any more. It is no accident that police unions are exempt from the new RTW law in Michigan. Police unions such as the FOP can continue in Michigan to demand either dues or agency fees from all police officers. Why? Police unions have historically been the unions most likely to support Republican candidates, particularly for court judgeships. NOTE: Despite continuing really heavy work duties, I am going to try to make posts in the next few days about “Whether and How RTW Laws Weaken Unions and Affect Workers” and “What the Evidence Shows on RTW Laws and Economic Growth”. Today’s post is an excerpt of something I wrote for another site. This year, in addition to my teaching duties at the college, I’m leading a project to update our college strategic plan. As part of that project I’m writing and editing a series of “briefing papers” (long blog posts, actually) about issues of strategic importance to the college’s future. When those papers cover a topic that I think might be of interest to econproph readers I’ll cross-post them. Last week I wrote the following about the student debt explosion in the U.S., the stagnation in hourly wages for those for with less than college degrees/credentials, and the implications for those of us who work in higher education. The full original post is here. America has a student debt problem. The red line shows the cumulative growth in student loans since 1999. The blue line shows the growth of all other household debt except for student loans over the same period. This chart looks like a mistake, but it’s correct. Student loan debt has grown by 511% over this period. In the first quarter of 1999, just $90 billion in student loans were outstanding. As of the second quarter of 2011, that balance had ballooned to $550 billion. 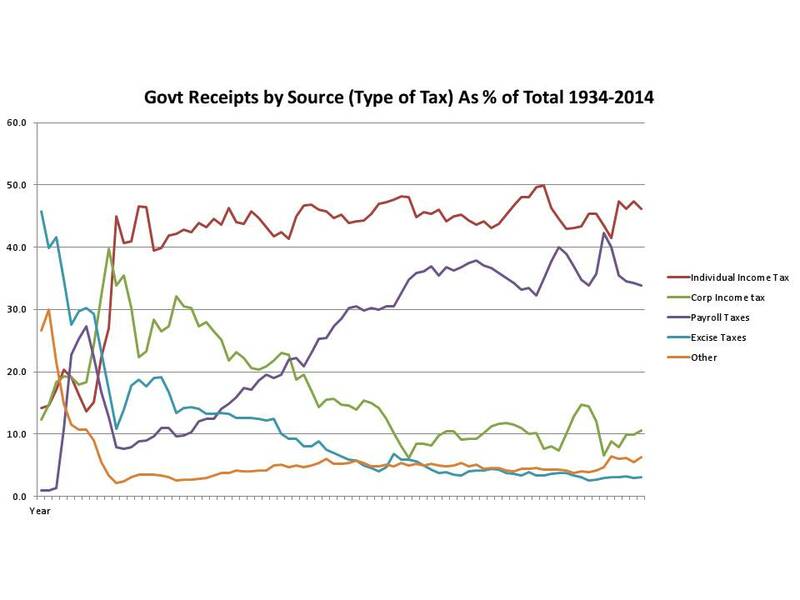 The chart is striking for another reason. See that blue line for all other debt but student loans? This wasn’t just any average period in history for household debt. This period included the inflation of a housing bubble so gigantic that it caused the financial sector to collapse and led to the worst recession since the Great Depression. But that other debt growth? It’s dwarfed by student loan growth. A long-term shift in U.S. political opinion away from thinking of higher education as a public good with direct funding support from government toward thinking that students should pay for their own educations with loans guaranteed by the government. Tuition and fee increases in higher education (particularly at 4 year schools and especially at private schools) have outpaced inflation for at least 3 decades, driven by cost increases, stagnant productivity, and reduced government direct funding. Middle class real incomes have been largely stagnant or only modestly increasing for those same 3 decades, limiting the ability of families to pay dependent students’ tuitions. The collapse of the housing price and mortgage bubble in 2006-07 which limited the ability of many middle- and working-class families to finance college education through home equity loans. High unemployment rates since 2008 have limited the ability of students to work while in college and have also sent increased numbers of unemployed back to college. … most community colleges can be a partial solution to the nation’s growing student loan burden. After all, [community colleges are] one of the most cost-effective providers of the first 2 years of a college education. Indeed, students can graduate with a bachelors’ degree with less total indebtedness if they take their first two years at community college and then transfer. But the growing student loan problem when combined with another trend has even more significant implications the community college mission. Long term trends in incomes in the U.S. including increasing income inequality have become a news headline topic in recent months. 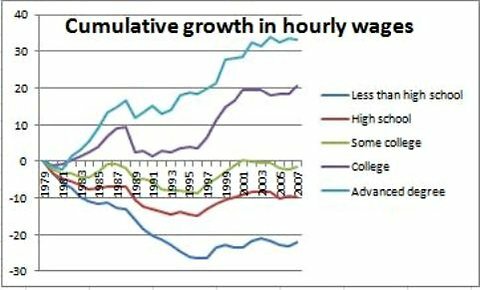 … As this graph from the Congressional Budget Office (via Paul Krugman) shows, over the past 30 years the clear trend in hourly wages for workers with less than high school or only high school education has been negative. A high school graduate now earns 10% less per hour in inflation-adjusted dollars than they did 30 years ago. Even workers who only have some college but haven’t completed a formal degree or credential are either negative or at best, even with 30 years ago. The data in the graph is from 2009 and labor market conditions have not improved since then. Indeed, most labor market economists, myself included, expect little to no improvement in wages or employment rates for many years to come. So what does this mean? It’s clear that for young and middle-aged people, the route to a rising income and participation in the middle class requires either a college credential or advanced degree. Yes, anecdotal exceptions are always possible such as the stellar young person who becomes a big success in sports or entertainment. But the numbers are clear – for virtually all, membership in the middle class in the future requires succeeding at college not just attempting college. The mission of LCC and community colleges in general since they were created has been to provide access. The great post-World War II expansion of community colleges in the U.S., of which LCC was a part, was based on the idea that broad, democratic access to higher education was important. Community colleges provided access to college for millions who otherwise couldn’t attend, either because of costs, lack of family support, family/work obligations, location, lack of preparation, grades, or other circumstances. Over time community colleges have expanded programs to help increase access to even more individuals. Indeed, this open-door, democratic access mission is a large part of the motivation for many who work at LCC. Providing access is something we could feel good about. But let’s consider how access has traditionally worked. LCC, like most community colleges, has focused on providing the same basic instruction and learning that was available at 4 year institutions. The difference was we had an open-door. We provided access. We provided a chance at college and greater income and success in life. But it was always considered up to the student to succeed. The historical model is the college provides the student a chance at success. If they didn’t succeed that was their problem. We measured our success by our enrolments as an indicator of the number of people to whom we had provided access. Thirty years ago, if a student attempted college and didn’t succeed it didn’t carry the consequences it does today. Thirty and forty years ago, a student who failed at college or simply didn’t complete could always get a job in a factory or a trade. They could still make a middle-class life despite not succeeding at college. Now the trends tell a different outcome. If a student doesn’t attempt college at all, they are likely not going to stay in the middle class at all and will likely experience declining real incomes. The big change is if the student does attempt college but simply doesn’t succeed or complete, today their prospects for staying in the middle class are slim. Successful completion of a college degree or credential has become a requirement now for a middle class future. It’s necessary for young people in particular to attempt and succeed at college now. But now let’s add the student loan issue. Suppose a person attempts college today but doesn’t succeed. Not only are they faced with the prospect of flat to declining real income, they have a significant burden – their student debt. Under current law there are really only two ways to discharge student debt – either pay it or die. Student loans cannot be discharged in bankruptcy. There’s no asset to sell or foreclose. So today’s student is facing a higher risk environment than their predecessors did in previous generations. Instead of access to college being a chance at a better life, it’s now a high-risk necessity. So it’s not just access; it’s success that matters. …The governments, both state and federal, are paying increasing attention to success rates. As mentioned in the first briefing paper, state governments, including Michigan, are increasingly looking at funding for higher education in terms of how many successful credentials or degrees does it produce, not just how many seats in classes were offered. Beyond what the government is requiring, the success issues pose a challenge to our understanding of our core mission and how we measure our institutional success. In today’s environment, providing access to large numbers of students without regard for their success is playing a cruel joke on them. It’s teasing them with dreams of a future many of them won’t achieve and then punishing them with a burden of debt. For those of us in the institution, that’s not the motivator that the original access mission was. We need to adjust our sense of the mission. Yes, access is important, but it needs to be successful access. Successful access as a mission changes many things. It changes our most basic metric of institutional success. Instead of simply enrollment growth showing institutional success at providing access, we now need to consider whether that access was successful. …But measuring success and access are one thing. Improving them is another. The shift to successful access calls for many changes in the organization, it’s processes, systems, the curriculum, teaching methods, support services, and attitudes. It is not easy or simple. It is very challenging. Occupy Wall Street Meets Fahrenheit 451 – Whose Property Rights? I’m not the most regular blogger. I really do strive to post daily, it often doesn’t work out. Sometimes my schedule pinched. Other times, health issues get in the way (ever try to write with a toothache?). But then there are times when the news makes me so angry I can’t find civil words that might illuminate instead of inflame. This past week my tooth hurt, but it was really the latter. As most know by now, the New York City Police organized and conducted a raid to evict the Occupy Wall Street protesters last week. They did it under cover of night using paramilitary tactics. There was excessive and unnecessary violence. I won’t go into that here. You can try one of the literally thousands of YouTube videos about the police brutality. It was an apparent coordinated national effort since 18 other cities conducted similar raids with similar tactics on the same day. Yale University lecturer John Stoehr has written how the order for the police to clear the Occupy Wall Street crowd from Zucotti Park came from Brookfield Properties, a private company, despite a court order allowing the protesters. For Mayor Bloomberg private property rights trump any kind of public rights, even when the public’s right is backed by a court. Stoehr also observes how Brookfield Properties is also subsidized by the public coffers to the tune of $174.5 million. Apparently those private property rights include the right to the public’s money. It’s no wonder that JP Morgan Chase has felt the need to bribe donate to the Police Department. The People’s Library, a library constructed by the New York Occupy Wall Street movement, was seized in the early morning hours of Nov. 15, by the New York Police Department during a planned raid to evict Occupy Wall Street protesters from Zuccotti Park. The library held a collection of more than 5,000 items and provided free access to books, magazines, newspapers and other materials. According to ALA members who visited the site, the library reflected many of ALA’s core intellectual freedom values and best practices—a balanced, cataloged collection, representing diverse points of view, that included children’s books and reference service often provided by professional librarians. City officials assured library staff that library materials would be safely transported to a sanitation depot, but the majority of the collection is still missing and returned items were damaged, including laptops and other equipment. The likelihood of recovering all library materials is bleak, as witnesses reported that library materials were thrown into dumpsters by police and city sanitation workers. “The dissolution of a library is unacceptable. Libraries serve as the cornerstone of our democracy and must be safeguarded. An informed public constitutes the very foundation of a democracy, and libraries ensure that everyone has free access to information. “The very existence of the People’s Library demonstrates that libraries are an organic part of all communities. Libraries serve the needs of community members and preserve the record of community history. In the case of the People’s Library, this included irreplaceable records and material related to the occupation movement and the temporary community that it represented. The American Library Association is the oldest and largest library association in the world, with more than 60,000 members. Its mission is to promote the highest quality library and information services and public access to information. The police and Mayor Bloomberg had no right to destroy these books, magazines, and computers. They had no court orders to do it. They simply did it because they could. Because they can’t tolerate people learning and thinking for themselves. In doing so, Mayor Bloomberg and the entire police force have revealed that none of this is about property rights as conservatives and libertarians like to claim. It’s not about the “rule of law” – they ignored the courts. It’s not about protecting some “liberty” or “Western cultural tradition”. It makes no difference whether the police seize steal private books and destroy them in hiding, or they burn them in public. There’s a long history of governments and police forces that destroy books. None of it is democratic or supportive of freedom. It’s about enforcing special privilege for an elite and for destroying democracy. It is in service to oligarchy, not democracy or liberty.